Yümi Signature Antioxidant Skin Care Serum is a 25% Vitamin C serum with Aloe Vera, Hyaluronic Acid, Organic Botanicals, and Superfruit Extracts (Pomegranate, Blackberry, Cranberry, Gogi Berry, Noni, Acai Berry, and Kale.) All of the ingredients work together to hydrate, minimize the effects of environmental damage, reduce signs of aging, and create a healthy glow. This serum comes in a 1 oz pump bottle and is a brownish clear gel that spreads on easily to the skin. It's the perfect consistency - not too thin, not too thick. It feels effective as far as leaving my skin smooth and hydrated with a nice glow. I look much better the day after using it than I do without. It can be used morning and night, but I usually use it only at night after washing my face. 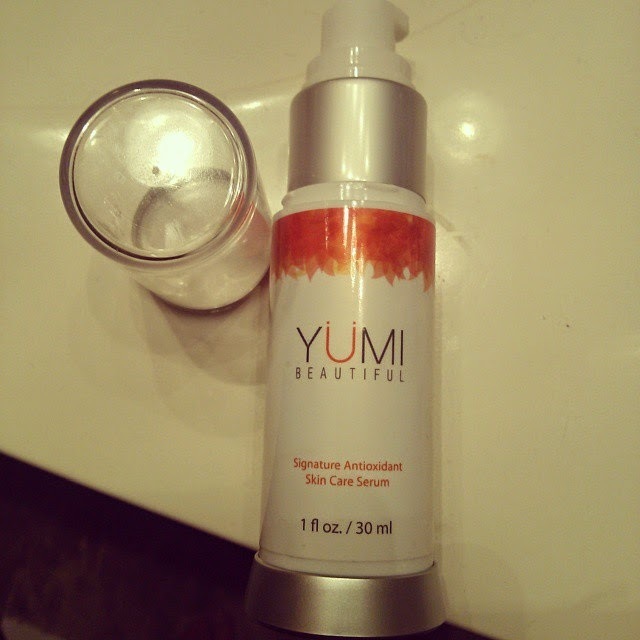 I really like all the ingredients in Yümi Signature Antioxidant Skin Care Serum and my face seems to react well to it. I think Vitamin C is important for your facial skin and helps improve appearance and reduce aging, so I would recommend this.